I’m not sure who enjoyed this bedtime story more: my 6-year-old son, or me. At first glance, this wonderful tale is more than a children’s story book. It’s an art collection. The vibrant colours, the wild characters, the awe-inspiring illustrations … it’s Africa on every page. The attention to detail and emotion captured in each illustration had us captivated from beginning to end. The story is not wordy at all, which I appreciate. After a long day at work followed by a taxing evening of “mamahood”, I often don’t have the energy to read chunky paragraph after chunky paragraph to my son; especially with him insisting I put on a bedtime one-man extravaganza, including voices, actions and all. Instead, I often punctuate bedtime stories with yawns. With Tug of War, I was delighted to see that each page was more wild and wonderful art, than words. It was a combination of the illustrations, the quick-read nature of this book and the few characters that inspired me to make this story a bedtime spectacle for my son. Outrageous actions and booming voices were the order of the evening. We both loved it. The moral of this tale is one that’s apt at any age: that brains beat brawn, and that friendship always triumphs. 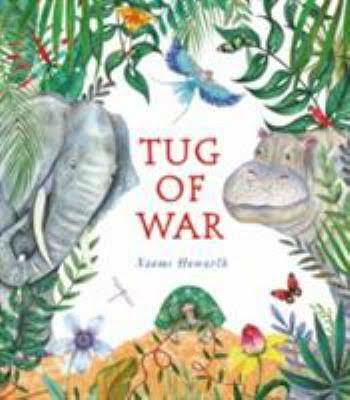 I was very surprised to learn that author of this Africa-inspired tale, Naomi Howarth, is Scotland-born and currently lives on a houseboat in West London. Her creative career started in the film industry, where she stayed for 18 months before pursuing a career in illustration. Her vivid illustrations combine lithography with watercolour. The Crow’s Tale, her first picture book, was shortlisted for the 2015 Waterstones Children’s Book Prize.